This banner is one of a pair. 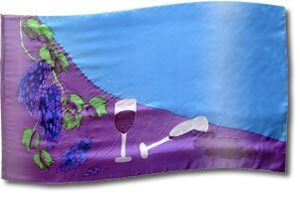 The two banners (The Bread and The Wine) complement each other in symbolising the most well-known sacrament of the Christian Church: communion. The golden cascade of wheat leading to the bread and the grapes to make up the wine represents the earthly realm. They are set against a backdrop of pale blue, which represents the spiritual or heavenly realm. Communion is a meeting at the intersection of these two domains. The Wine, symbolic of the sacrificial cup that our LORD and Saviour accepted by the outpouring of His blood, was used at Passover to represent the fullness of the blessing of salvation, which was destined to cover the entire life of His disciples. In thankfulness and fellowship through communion, we reach out to Jesus to receive of His irreplaceable provision. Communion finds its roots in the Passover feast where God's people remember their deliverance and redemption to be called God's people. The story is found in Exodus 12:27 and Exodus 13:3-5. Communion is one of only two ceremonies that Jesus modelled for us as outlined in Matthew 26:26-29, Luke 22:19. Paul then passed on "what he had received from the Lord" in 1 Corinthians 11:25. First Corinthians 11:18-34 teaches us that when we participate in communion, we must consider the other people around us and partake of it in a worthy manner. It is a way of refocusing our attention back the Lord Jesus Christ and proclaiming His death and return. (1 Corinthians 11:24-26) and is a good opportunity to examine our relationship with God and others (1 Corinthians 11:28-29, 31-32). Genesis 1:29-30 and Psalm 104:14, 15 states that wine is a gift from God and that He is even involved in providing the conditions for food and wine to grow. (also Matthew 5:45). The Bible warns against the abuse of wine which is drunkenness in Ephesians 5:18, 1 Corinthians 6:9-10 and 1 Peter 4:3 and encourages us to consider other people's reaction to our drinking and whether or not it would become a stumbling block to them in Romans 14:20-21. However Psalm 4:7 says that having a relationship with God is better than anything wine or food has to offer. Blessing, Blood, Cup, Fellowship, Provision, Sacrifice, The LORD Your Saviour, Thankfulness, Wine. Dark Blue: Authority, From Above (Exodus 24:10; 28:31; 39:22; Numbers 4:6; 15:38; 2 Chronicles 2:7; 3:14; Ezra 1:26; 10:1; John 14:26). God with Us, Holiness, Holy Spirit, Heaven, Our God Is a Holy God, Spiritual or Heavenly Realm, High and Lofty One (Exodus 24:10; Psalm 119:105). White: Holiness of God, Cleansing, Light, Sanctification, Righteousness, Purity, Christ, Angels, Saints (Ecclesiastes 9:8; Daniel 7:9; Isaiah 1:18; Matthew 17:2; 28:3; Acts 1:10; Revelation 3:4,5;18, 4:4; 6:2; 7:9; 15:6; 19:8).